Lanhydrock House is cleverly laid out as if the family has just stepped out. Buckets are lined up in the housemaids' closets, black boots stand polished by the bed and tobacco pipes lie waiting for the gentlemen in the smoking room. The dining table is set for dinner and the menu is handwritten in French. The interior of Lanhydrock is a snapshot of country living for the well-heeled in 1890. This is history at its most authentic. their most colourful in the spring. The original house was built in the 17th century and the ornate gatehouse still remains from 1651. However the original land and Barton, or farm, was originally part of the Priory of St Petroc in nearby Bodmin. During Henry VIII's dissolution of the monasteries, the estate came into the hands of the Glynn family. It changed hands several times until Lyttelton Trenance sold the estate to Sir Richard Robartes in 1620, when the story of the present-day house really begins. The money lavished upon the family home was generated from the tin trade which the Robartes family was heavily involved in as merchants, moneylenders and bankers. Such was their influence that in 1616 Richard Robartes (who had upgraded his name from the more common Roberts!) was made a Baron by James I, as in the king's view he was "wealthy enough to be a peer". Unfortunately even in those days there was no such thing as a free lunch and the Baroncy cost Lord Robartes a hefty £10,000. he escaped from the royalists troops during the Civil War but his children were held prisoner at Lanhydrock. A destructive fire in 1880 destroyed much of the house except the north wing, the entrance porch and the gatehouse. Lanhydrock was consequently rebuilt with the very best that money could buy. The 49 rooms which are open to guests shows life on a wealthy country house estate. The family rooms are lavishly furnished in Victorian style and the nursery is a fascinating collection of favourite 20th century toys. Guests will marvel at the ornate plaster ceilings, tapestries, furnishings and the Long Gallery lined with colourful scenes from the Old Testament. 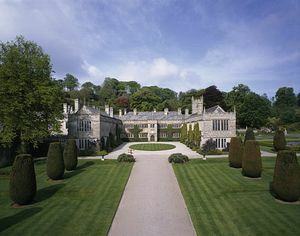 Not content with the fascinating authentic country house, the 22-acre gardens at Lanhydrock are quite superb. 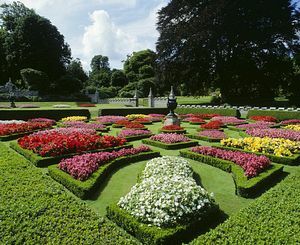 Rhododendrons, azaleas, camellias and magnolias grace the gardens around the house. Once a tour of the 19th century formal gardens is complete, take a walk along the banks of the Fowey River through the extensive woodland. 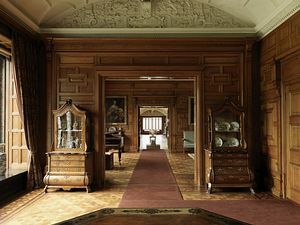 The National Trust restaurant at Lanhydrock serves local Cornish fare including Oggie pasties and cream teas, no doubt as once served from the kitchens of the "big house". Local produce and gifts can also be found in the well-stocked shop and there is an extensive plant nursery in the car park.